The Houston Maritime Museum has educated and entertained visitors for fourteen years with the mission “To capture and preserve the wonder and influence of maritime history and the marine industry with focus on the development of Houston, the Texas Gulf Coast, and the State of Texas.” Located on the outskirts of the Museum District, the museum has eight galleries filled with model ships, images, and artifacts that trace maritime navigation from the Bronze Age to the present. The collection is so extensive that the museum has outgrown its space and has plans to move to a larger site along the Houston Ship Channel, a fitting place for visitors to discover the wonder and influence of the maritime world. Even though Houston became one of the world’s largest ports during the twentieth century, the maritime industry was not represented among local museums. 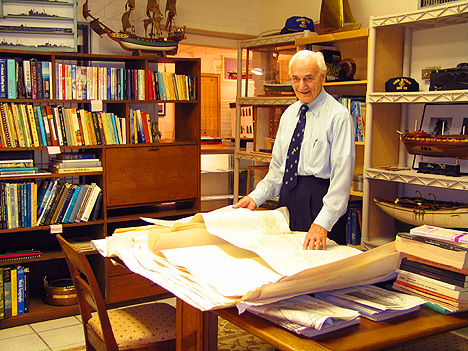 Established in 2000, the Houston Maritime Museum (HMM) was an extension of founder James “Jim” L. Manzolillo’s unique experiences, personality, and lifelong association with the ocean. As a naval architect, Manzolillo traveled extensively, collecting artifacts from around the world. He eventually decided to share them with the public, and Houston offered a logical place to do that. Hence, Manzolillo began channeling his resources to create a museum to engage people of all ages in the history of ships and sea exploration. 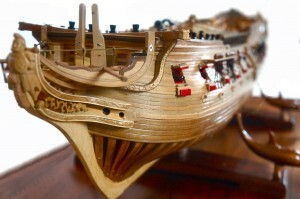 Master modeler Ronald Roberti’s exquisitely detailed model of the USS Confederacy illustrates how eighteenth-century shipwrights documented all the details of a proposed ship’s designs for approval before Computer Aided Design (CAD) or even much skill in drawing flat representations of compound ship hull curves. Photo courtesy of the Houston Maritime Museum. To read the pdf of the full article click here.